As I'm sitting in Honey's Kettle, a man from the back of the kitchen is shouting towards the front, trying to get the attention of a young man sitting at the counter. The young man, as young men do these days, sits completely oblivious to the world with earbuds in each ear and paying close attention to whatever is streaming through for sound. He takes no notice of any of his surroundings. I volunteer my services and get the attention of the young one and watch as he steps up to help in the kitchen after being summoned. The man in the back is Honey's Kettle founder Vincent Williams and the young man he's calling to is, presumably, his son. 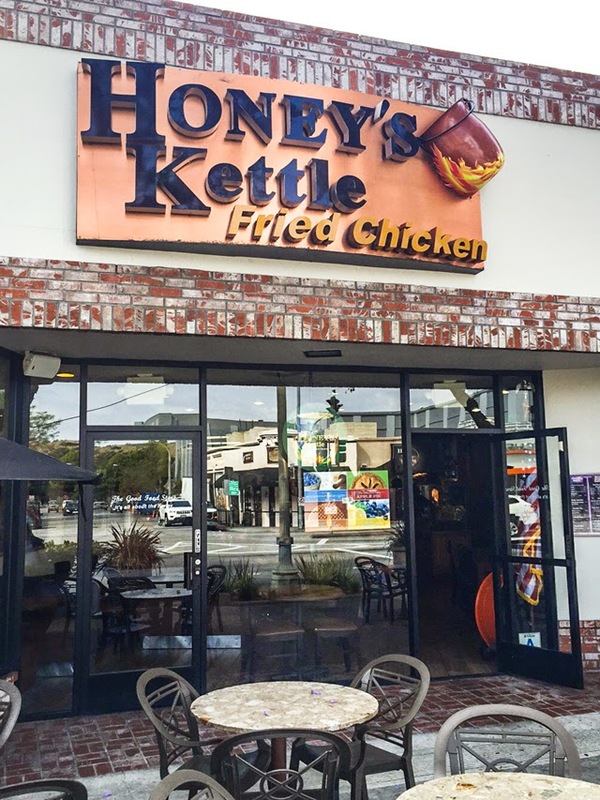 This is Honey's Kettle - a non pretentious family-run outlet in Culver City that is responsible for, what I believe to be, the best fried chicken in Los Angeles. It's a family run treat for your tastebuds and I've told everyone that will listen that it's a must visit destination while in LA. I'm not the first person to write about Honey's Kettle Fried Chicken and I doubt I'll be the last. People Magazine, The Food Network, Los Angeles magazine and many more have all taken a turn at the counter at Honey's Kettle, and have all walked away with the same verdict- this chicken is life changing. Now, let's all keep in mind I'm a southern. I was raised on fried food and consider myself somewhat of a connoisseur when it comes to the topic. I know good fried chicken. Since living in London, I also have come to know bad fried chicken, very bad indeed (although I should be fair and say there are many chefs who have managed to get it damn near close to perfect in recent years. When I say "chefs," I don't mean the Colonel). But I'm getting ahead of myself here. Let me take you back eight years in time. It's my first week in Los Angeles- my first week ever in the city. I'm there because I'm in love. I'm in love with a boy, head over heels, in fact. I mention this because it's important. When you're in love everything tastes better. Everything is right as rain and your tastebuds take on a new role in your life - they are memory savers. Every bite is something to be recorded and remembered as pure bliss. This first week was my first interaction with Honey's Kettle. 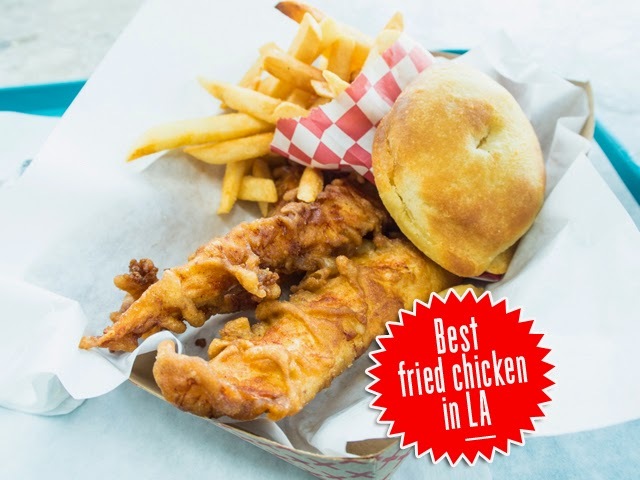 The boy at the time, let's call him "A," drove me into Culver City to experience what he called "the world's best fried chicken." As expected, the chicken was the second coming of clucking perfection. "A" and I enjoyed the good eats and I went away thinking no other chicken would ever match this heavenly experience. Was it the love talking or was it the truth? Well, fast forward eight years and I'm back to test my tastebuds, checking romance at the door. It's been a while since the whirlwind love affair and I've got a fresh take on life and cuisine. I walk in the door and am flooded with memories of my first visit, yet am approaching the chicken with trepidation. I don't want to be let down. I order the chicken stripes, as everyone will agree they are the best thing to order, with a biscuit and fries. The stripes are dipped and fried fresh, so it can take up to ten minutes to prepare the dish (they recommend you call ahead for this order). While it isn't exactly fast food, it's worth the wait. 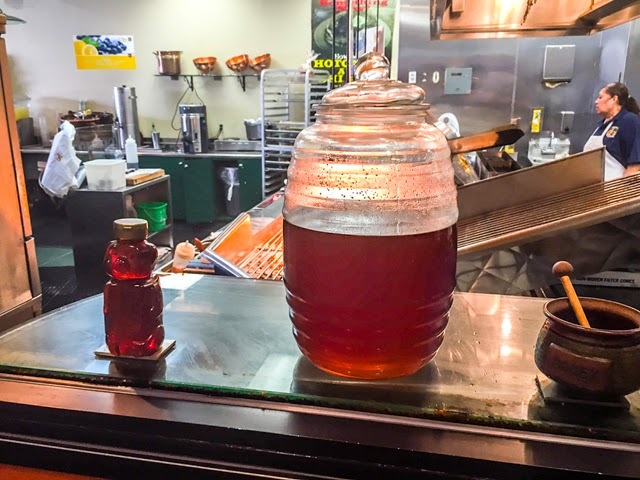 Founder Vincent thanks me for getting his son's attention and we chat a little bit about Honey's Kettle. I tell him I have great memories here and that it's my favourite chicken this side of the South and he says he's pleased to hear it - without a moment's pause. This is pure and beautiful fried chicken pride. At the time, neither of us know that I will be writing a piece about this whole experience. Important to mention so that you know this is all coming from a pretty innocent love of an incredible place. As I go to sit down, thank the powers at be for giving me the opportunity to return, and start to tuck into my chicken meal, Vincent approaches and asks if I have everything I need. I ask if they have their trademark honey to dip and some honey mustard sauce and he runs to the back to retrieve both for me and says he hopes I enjoy my lunch. 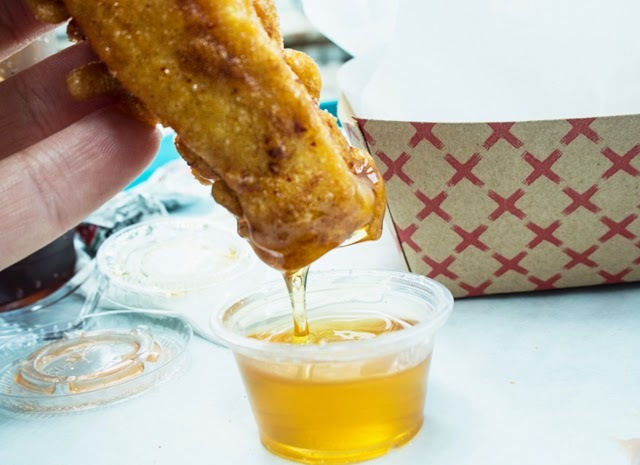 As I take the first bite of my piping hot chicken stripe, I write my first line for this piece, because I realize I have to share - I can say, hand on heart, that Honey's Kettle is THE BEST FRIED CHICKEN experience had in quite some time. If LA does officially become home in the coming months, Honey's Kettle will be my home away from home for a true southern fried chicken fix. While I always hate to write too much about any one place, for fear of taking away from your own first experience, I will tell you that the reason Honey's Kettle is only in part because of it's freshness. What your tastebuds will really be bouncing around the block about will be the kick of honey that gives the place its title. 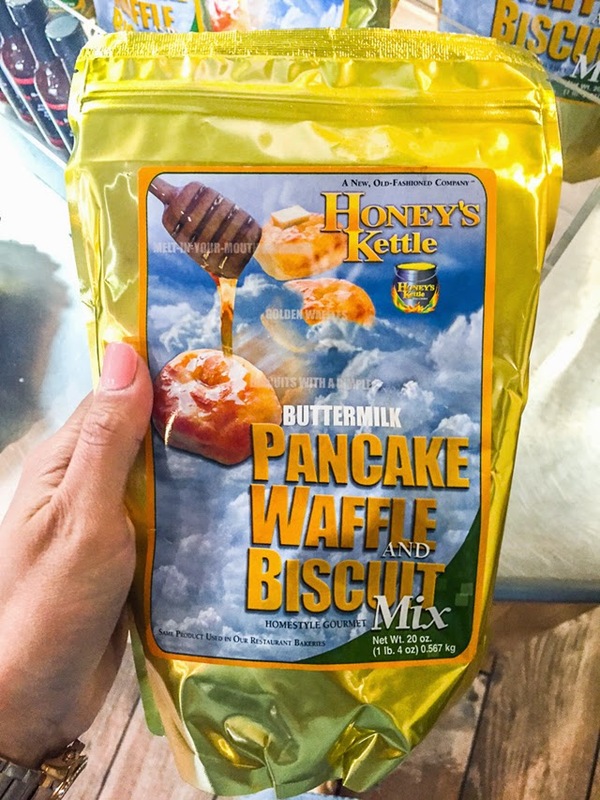 Bottom line, if you don't visit Honey's Kettle- you are missing out.